Birkdale School > News > Senior School News > You can Bank on Birkdale! You can Bank on Birkdale! 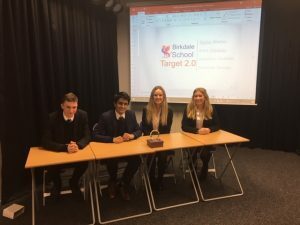 As reigning champions, Birkdale School hosted the Northern Schools’ Final of the Bank of England Target 2.0 challenge. The challenge involves teams presenting their view on what interest rate and level of quantitative easing, along with any other aspect of monetary policy should be set in order to meet the Government’s inflation target of 2.0%. Presentations are followed by a series of gruelling questions from the panel of judges from the Bank of England and academia that stretch students’ understanding well beyond the A level Economics syllabus. Typical judges’ questions included: ‘Is Brexit just another Millennium Bug?’ and ‘Why has the short-run Phillips Curve become flatter?’. 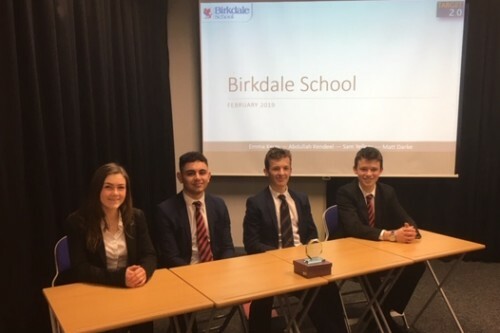 Birkdale fielded 2 teams and showed our strength in depth, eventually coming a very close 2nd and 3rd to strong competition to the team from GSAL. The team of Emma Kerry (Captain), Abdullah Kendeel, Sam Yellops and Matthew Darke came second, while the team of Rishin Madan (Captain), Anna Wadsley, Jonathan Hadfield and Charlotte Savage were third.